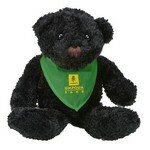 Personalized stuffed animals easily identify your company during industry expos and create long-term brand recognition. Our printed promotional stuffed animals are a must-have for any child-friendly company that participates in industry events, including in the healthcare field like doctors and dentists. Promo stuffed animals let visitors to your booth or table at industry events know exactly who you are and they come in a variety of colors and styles, with your logo and information printed beautifully. Use the 6" Plush Big Paw Bear with Shirt as an eye-catching promotional toy in your next marketing campaign and draw attention to your brand name and tag line. The bear and shirt come in the following colors: bear: brown or white, shirt: white, royal blue, black, forest green, pink, athletic gold, light blue, orange, heather gray, purple, red, lime green, navy, or brown. 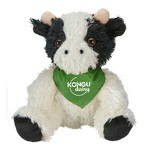 The 6" Plush Big Paw Dog with Shirt will create a large impact of your care and concern for animals. The dog and shirt come in the following colors: dog: brown/white. The 6" Plush Big Paw Panda with Shirt is endearing. It is cute and cuddly. The 8 ½" Plush Big Paw Bear with Shirt is a cute and unique way to promote your brand. Imprint on the shirt using standard transfer colors and create a good impression of your brand among families. The 8 ½" Plush Big Paw Dog with Shirt will appeal to people across all age groups. Imprint on the shirt using standard transfer colors and create a good impression of your brand among families. 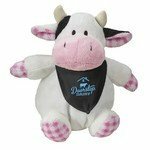 The Playful Pals Cow features variety of bandana colors to choose from and your brand imprint on the t-shirt for Business Swag. Our Color Bear Black features variety of t-shirt color options and allows adding company logo and message to Promote your Brand. 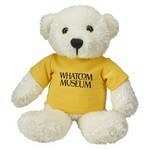 Our Color Bear Cream features soft and cuddly design, Customizable with your logo to create exciting Business Giveaways. 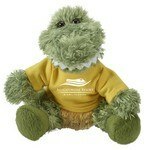 The Cuddliez Alligator features soft and cuddly design and allows inserting brand details to create exciting Business Giveaways. 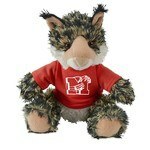 The Cuddliez Bobcat features high quality, soft construction, Customizable with company details to Promote your Brand. Our Cuddliez Cow features variety of color options for t-shirt and allows inserting custom details on it for Brand Recognition. 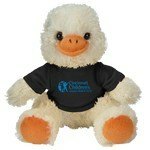 The Cuddliez Duck features variety of t-shirt colors and allows adding company details to Promote your Brand.